The annual Barry Nash Memorial hurling competition was played on Wednesday afternoon. Barry and his two brothers Cathal and Diarmuid were all past students of Cistercian College. All three brothers were keen hurlers and their father Jim was a prominent member of the Hurling Support Committee. Tragically Barry lost his life in 2014 in a car accident. In his memory his family donated a cup and since then the memorial hurling event has been played each year on the playing fields of the College, where Barry and his brothers spent many afternoons. 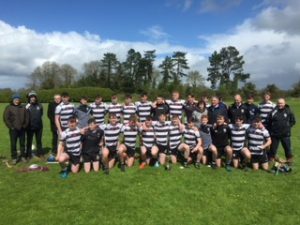 Teams from other schools are invited to compete in the tournament and this year we were delighted that the trophy will stay in CCR as our team were victorious beating Colaiste Pobail Roscrea in the final. Congratulations to all the players and to their coach Mr. Quigley. Thank you to Brendan McKeogh for organising the tournament. A sincere thank you to Jim and Mary Nash, Barry’s parents, for travelling each year to CCR to support this event and to present the prize. Their continued support of CCR is very much appreciated. Copyright © 2018 Cistercian College. Boys Boarding School, Ireland.